The Art of Event Planning Planning the perfect event is definitely an art—and it all begins with your choice of location. No other venue in the city offers such choices between a panoramic view of downtown and the Mississippi River, or mingling among the region’s finest works of art in addition to other unique spaces that will meet your specific event needs in the Shaw Center for the Arts. The LSU Museum of Art offers a group of elegant, yet functional, settings for a variety of social, corporate, or nonprofit affairs. In addition, our professional staff has hosted many wonderful events and can share a wealth of experience, creative expertise and our premier vendor partners to ensure your event exceeds your expectations. Rental Rate Includes: •	Event setup time: 2 hours before event (additional hours at $35.00 an hour) •	Event cleanup time: 1 hour after event (additional hours at $35.00 an hour) •	3 hour minimum event with up to 150 guests (additional hours at $300.00 an hour) •	1 Janitorial porter(s) (4 hours included) additional hours at $25.00 an hour Security: (6 hours) •	1 officer will be scheduled for events of 0-150 guests (included in rate) additional hours $25 an hour Event Staff: •	1 event representative (up to 6 hours for 150 guest) additional hours $25.00 an hour •	Available for use: Client responsible for arranging set-up and breakdown o	10 (24”) cocktail tables o	6 (6 ft.) banquet tables o	100 black and 25 grey conference chairs o	Podium Limited items (when available) at an additional cost: •	Portable bar, AV Equipment, Linens, Pipe-n-drape, up lighting, 100 chair covers, set-up & break-down. The Alfred C. Glassell, Jr. Board Room with 25-chair board table is perfect for meetings and features space for extra seating. With panoramic views of the Mississippi River, downtown and the Old State Capitol, and a distant view of Tiger Stadium, the Irene W. Pennington Rooftop Terrace offers an extraordinary setting for your event. This beautiful outdoor area provides a spectacular outdoor experience perfect for memorable cocktail receptions, elegant dining under the stars or any event where you want to make an impression. Accommodates 300 guest’s cocktail style or 200 persons for outdoor dining Please contact a manager at Tsunami for more information 225-346-5100. The Charles Phelps Manship, Jr. Floor offers the 2,000-square-foot Bert and Sue Turner Gallery with sweeping views of Lafayette Park and the Mississippi River. The adjoining Alfred C. Glassell, Jr. Board Room with 25-chair board table is perfect for meetings and features space for extra seating. 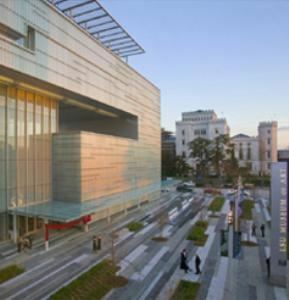 Special Features: Inside the 125,000 square-foot facility is the LSU Museum of Art, the Manship Theatre, Hartley/Key Theatres, Jones Walker Foyer and The Gallery, the LSU School of Art Glassell Gallery, an exciting combination of retail and restaurant destinations.